Company Overview - Tianjin Kelioil Engineering Material And Technology Co., Ltd.
6YRSTianjin Kelioil Engineering Material And Technology Co., Ltd.
Tianjin Kelioil Engineering Material and Technology Co., Ltd. is a scaling up hi-tech enterprise specialized in producing cementing additives with a full set of the most advanced producing line in China. 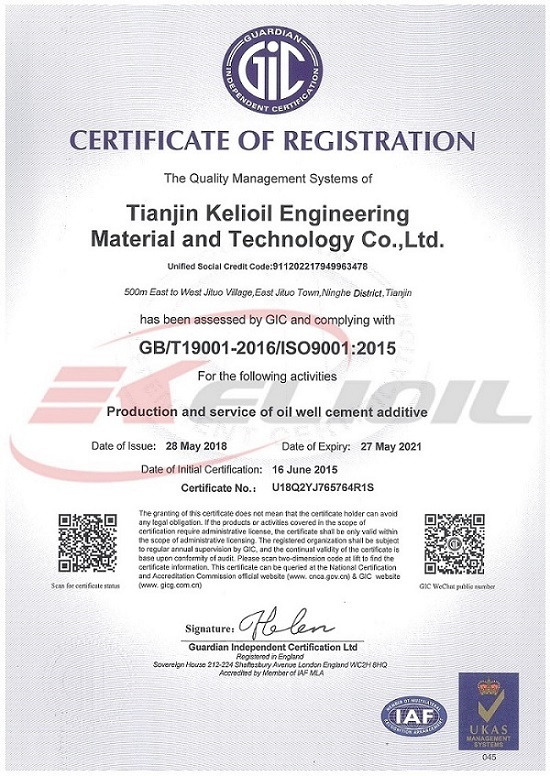 Holding ISO9001 and ISO14001 certificates, Kelioil is the biggest global supplier for cementing additive industry in China and can do OEM globally. Kelioil's headquarter is located in the core area of flourishing Tianjin Huayuan high technology industry park. Covering the area of 30 thousand square meters, the producing site of Kelioil has factory and storehouse of more than 10 thousand square meters. The comprehensive producing capacity reaches 30 thousand-plus tons with annual producing capacity of 10 thousand tons of cementing additives, 20 thousand tons of cementing admixture including silica fume, silica flour, high density hematite and bantonite, etc.With strong scientific and researching capacity and full set of testing facility along with mature techniques, Kelioil is the excellent manufacturer in cementing additives and related products. The most advanced technology, most completed product specification, most mature system and the strongest adaptability in water quality and materials are the keys to enable Kelioil to be competitive in the world over. 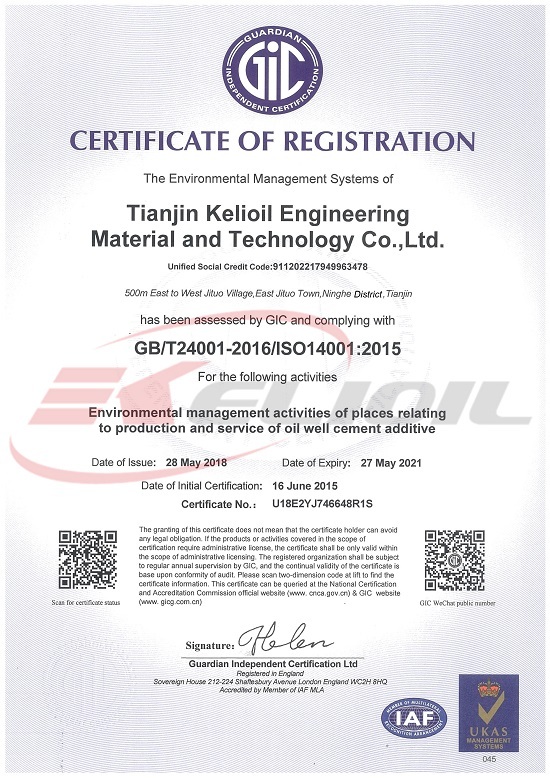 Kelioil, self-developing all the products and holding intellectual property rights, has completely mastered the core technology of producing qualified cementing additives and related products and formed distinguished operating style. Its products and technical documents serve as model for other manufacturers. Muti-fuctional AMPS polymerised powder fluid loss additive, powder sulfonated acetone-formaldehyde condensation polymerized dispersant and powder retarder are Kelioil's most competitive products. Powder form products are easy to be water-mixing and dry-mixing. They are suitable for all oil well cement in the market and the diversity of water quality in the spot. At the same time, they can also be used in the brine. Its applicable temperature range is wide and can be used in high temperature. Main facilities:Testing facility: six HPHT consistometer including one imported from America. Three of NPT consistometer, HPHT fluid loss cell and rheometer. One pressure testing machine, one American HPHT stirring fluid loss cell and two Borivier viscometers Liquid facilities: full sets of intellectual computer control compressive synthetic reaction kettle and assorted reactor from batching- synthesizing-value fixing to filling.Solid facilities: one high speed centrifugal spray driers, high speed disintegrator, one German IVA high speed disintegrator,one solid blender, Packing facilities: one Korean automated packager, and Japanese Newlong high speed sack sewing machine. Our global customers: Canada, Russia, Colombia, Kazakhstan, Kyrgyzstan, Indonesia, Burma, Philippine, Middle East Asia.